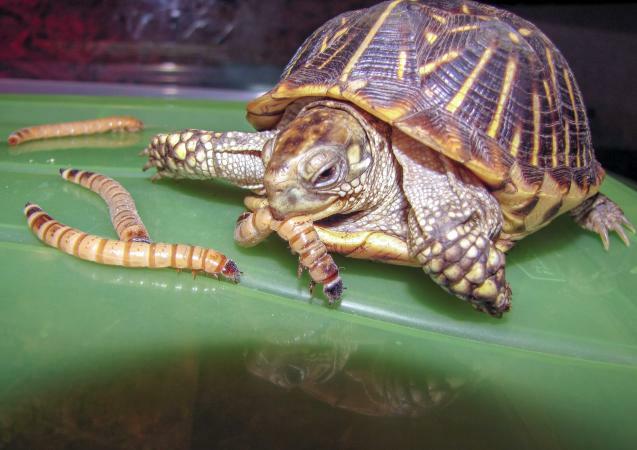 Box turtles can be finicky eaters when they're in captivity and while keeping one as a pet is relatively easy, finding the right box turtle diet often isn't. As challenging as it may be, finding the right box turtle food is the most important thing you can do for your pet if you want it to live a long and healthy life. When Easter box turtles and other varieties of box turtles live in the wild, their metabolism goes through many fluctuations. Seasons, natural food availability, temperature, and lighting all play a role in how and what the turtle eats. These natural changes are no longer a part of the turtle's routine when it lives in captivity, and it can become confused and/or very fussy about what it eats. Out in nature, a box turtle will normally retreat into its shell and wait for better feeding conditions if food is not available. This doesn't happen in captivity. If the captive turtle isn't fed regularly, it will start to deteriorate and eventually weaken and die. Box turtles are omnivores which means that they eat just about anything, including vegetables, fruits, and meat. While they can eat a wide variety of foods, they should never be fed food that they wouldn't otherwise come across in nature. This means you shouldn't feed your box turtle things like hamburgers, hot dogs, potato chips, and other foods specifically for humans. The list of what box turtles eat contains a variety of food items. Vegetables such as these should make up 75 percent of your box turtle's diet. Also suitable for feeding your box turtle but not in large amounts is cooked chicken or beef heart but never feed your turtle raw meat as it could increase the risk of bacterial contamination. There are many brands of commercially made dry turtle food on the market, most of which claim to be "nutritionally complete," but these should not be the only thing you feed your turtle. They can be added to your turtle's diet as a supplement but they're not recommended as a lone food source. Before feeding your turtle dry food, soak it in warm water for about 30 minutes to soften it up. It can be very difficult to come up with a diet that meets your turtle's nutritional needs and is also one that the little guy will actually eat. Therefore, many experts agree that vitamin supplements are beneficial to most captive turtles, especially if they are kept indoors. Sprinkle a good quality reptile multivitamin supplement on your pet's food a couple of times a week. An adult box turtle should be given meals at least three times per week, with meals every other day or every third day. Consult with your veterinarian if you're not sure about the frequency. Juvenile and baby box turtles should be fed daily and given vitamin and calcium supplements at least three times a week. A variety of foods should be provided at each feeding and you should remove any uneaten portions after about 15 to 20 minutes although live food such as insects can remain. If you have a box turtle that hibernates, you will not have to provide food during his dormant months but he should always have access to water. Depending on your turtle's temperament, you may need to feed him in a hide box if he is shy. If you keep more than one turtle together, you will also need to feed them on separate plates or feeding areas, or even separate them completely if one will not allow the others to eat. Ideally, the diet for feeding your box turtle should be adjusted often. If fed the same thing day after day, the turtle will grow tired and, in many cases, will go on a hunger strike. Mix up your turtle's diet so it eats different things on different days. This will help ensure that your pet stays interested in feeding time, and it will help ensure that it's getting a proper and balanced diet.